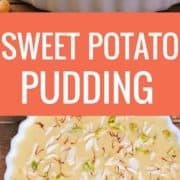 Indian Sweet Potato Pudding is a rich and fragrant dessert made with sweet potatoes, whole milk, sugar, cardamom, saffron, nuts and kewra water. Food for the soul! This is the Indian version of sweet potato pudding: a very traditional, very decadent dessert called Shakarqand Kheer. It reminds me of long-ago, lavish dinners hosted by my mother when every item on the menu was a classic, painstakingly and lovingly prepared by her. Dessert was almost as important as the main meal and always consisted of time-honoured preparations like kheer, halwa or kulfi. These were not instant, readily-made dishes conjured out of a packet or a tin. They took time and effort and imagination and, of course, the results were outstanding as well. And why not? 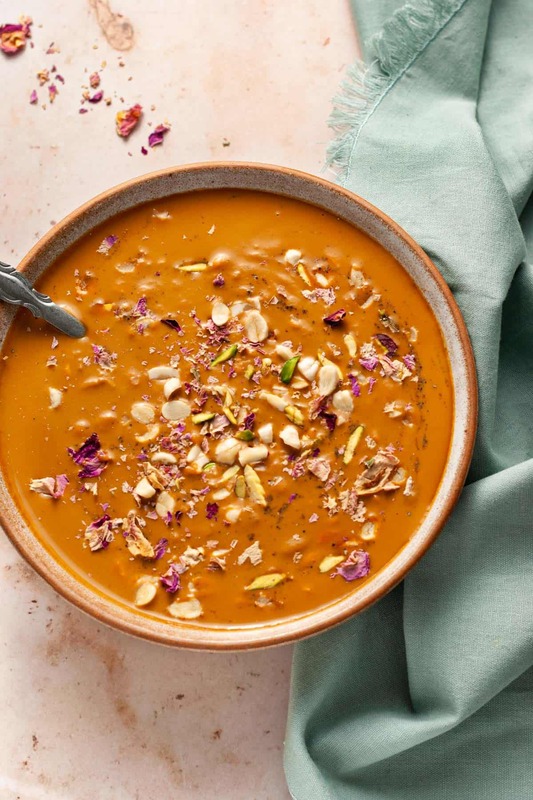 When you have ingredients like milk, sweet potatoes, nuts, cardamom and saffron, you can’t go wrong. Saffron, especially, gives the kheer a very special taste. Plus, the bright orange strands add a festive little touch. Just a reminder with saffron: don’t go overboard and add more than what’s specified in the recipe, especially if you’re also garnishing the kheer with it. The reason? Good quality saffron can quickly overpower the other flavours. Too much of a good thing is never good! One final note: There is no shortcut to this recipe as the deliciousness of kheer depends on slowly cooking and churning the milk on a steady heat till it becomes thick. There! I have just given you a simple secret to the rich taste of Indian desserts. If you try to speed up the process by reducing the cooking time, the taste will be compromised, and you will have a watered-down version of the original on your hands. But if you follow the steps in the recipe, you will have recreated a masterpiece. Be prepared to sit back and enjoy the compliments pour in after that! 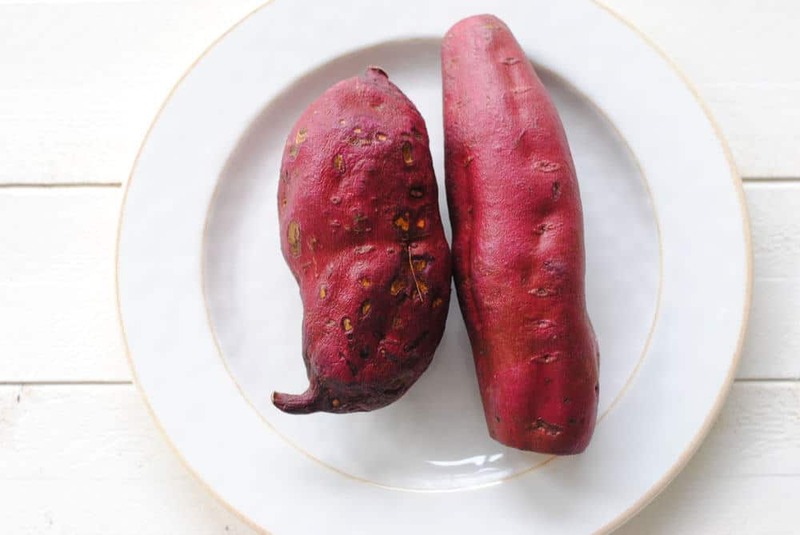 Boil the sweet potatoes until they are soft just as you would potatoes. Remove the skins and mash them fine. Reduce heat and cook the milk till it reduces in quantity to about half. The measure of doneness is when the milk has thickened considerably and the colour has changed to a golden yellow (1.5 to 2 hours). Keep stirring the mixture every few minutes. Add the sugar, cardamom powder and saffron strands and cook for another 10 minutes. Turn off the heat and mix in the kewra water. Take out the kheer in a dish and garnish with slivered pistachios, almonds and more saffron if you wish. Serve cold. 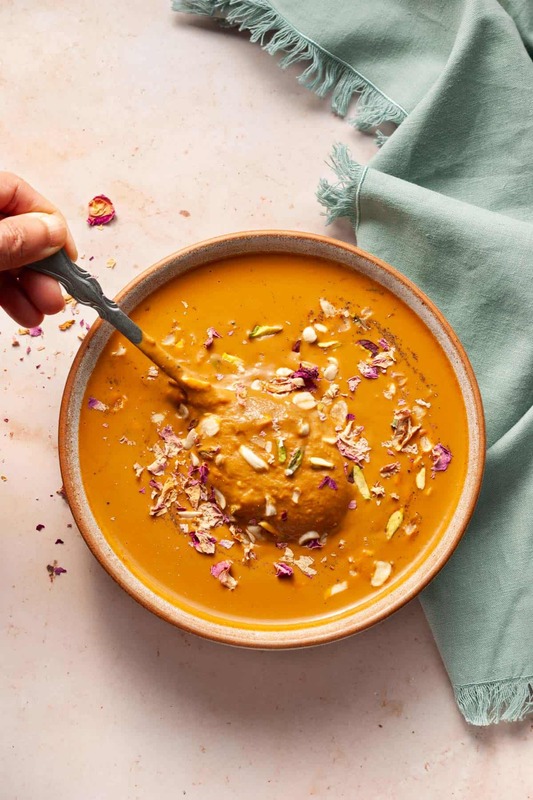 If you want to make sure the kheer is smooth and lump-free, puree the boiled sweet potatoes in a blender along with some milk till you get a puree. Then, add this puree to the pan of milk. Kewra water is an extract from pandanus flowers. A clear, fragrant liquid, it is very similar to rose water, and is used for flavouring desserts and biryanis in North Indian cuisine. It is readily available in Indian grocery stores. This looks absolutely delicious. I’m dying to try it! I have never heard of anything like this before. Thanks Sarah! It is quite delicious. Do try it.